Shave the fennel as thinly as possible, using a mandoline, a meat slicer, or by hand. 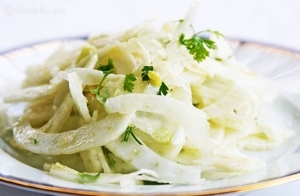 Place the shaved fennel in a bowl and toss with lemon juice, olive oil, and salt and pepper. Divide the fennel among four small plates. Scatter some mint on top of each salad and garnish with shaved Parmesan.